An “armed and dangerous” prisoner was arrested in Washington, DC nearly nine hours after escaping from custody in one of the largest hospitals in northern Virginia. The suspect also carjacked two cars while attempting to evade the manhunt. The suspect, 42-year-old Wossen Assoye, was captured just before noon in Southeast DC, Washington’s Metropolitan Police Department said. 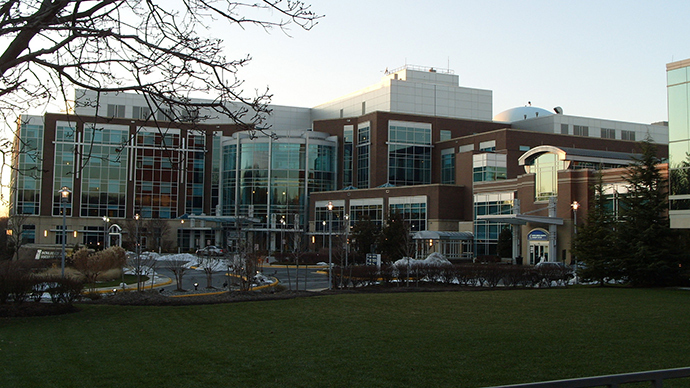 The incident began at around 3 am ET at Inova Fairfax Hospital in Falls Church, Virginia. The Fairfax Police Department tweeted that a search was underway in the area for the escaped convict. He was described as a 6-foot-tall black man, weighing 170 pounds and wearing a hospital gown. Police added that the prisoner had been in “the custody of a private security guard.” He escaped with security officer gun and is wearing a hospital gown and no shoes. Assaye is “armed and dangerous,” police added. Assaye was being held by Alexandria City “on federal charges for armed bank robbery” police wrote on Twitter. He was taken to hospital after he attempted to harm himself. The escaped prisoner may be with his girlfriend, police added. Residents in the area should be aware of the threat, Fairfax County Police Chief Ed Roessler said at a news conference. “We all need to be concerned because he is armed, he is a felon and he has attempted to flee,” he said, adding that the prisoner’s escape had caught the police unawares. Fairfax County Police spokesperson Ellen Pittman told CBS news that it was yet unclear if anyone in the hospital was injured. The escapee carjacked a woman in the Annandale area of Fairfax County around 7 am, making off with her silver 2002 Toyota Camry, police said. Escaped prisoner is driving a stolen silver 2002 Toyota Camry with VA tags: XZP-8153. Call police if you see it. The authorities closed all roads around the hospital and staff are to go to nearby Falls Church High School to get a “shuttle bus pick up,” police added. The lockdown at the hospital was lifted around 8 am ET, and several roads in the area that were closed have since reopened. During the lockdown, Fairfax County ambulances were ferrying patients to other hospitals, and an emergency announcement came over a loudspeaker, saying patients must remain in their rooms, according to a WTOP staffer who was at the Inova Fairfax hospital at the time. By 10 am, police said they were pursuing a 2008 dark silver Hyundai Elantra the suspect was said to have carjacked. They also believed he had changed clothes and might have been wearing a dark-colored jacket and blue jeans. Neither carjacking victim was injured, Fairfax police said. Assaye is suspected of having been involved in a dozen bank robberies in Northern Virginia since October 2013. He earned the nickname the “Bicycle Bandit” because of a propensity to escape from crime scenes on a bicycle, the Washington Post reported. He has only been charged with one bank robbery, which occurred on March 20. He has since been charged with escaping federal officials in connection with his escape from the hospital, charging documents said. Assaye was convicted of burglary and robbery in the late 1990s, and served time in prison from 2000 to May 2013, according to an FBI affidavit.